Award-winning translator Deborah Smith said Wednesday that staying faithful to the spirit of a text was her priority. And the spirit that she tried to preserve in Han Kang’s “The Vegetarian” was one of “tenderness and terror at the same time, never too far one way, always this very perfect balance,” said Smith at a press conference held at the Seoul International Book Fair on Wednesday. “The style was so controlled, restrained, without being cold and indifferent, and so those two things were the things that I concentrated on the most to make sure they came across properly in my translation as well,” she said. 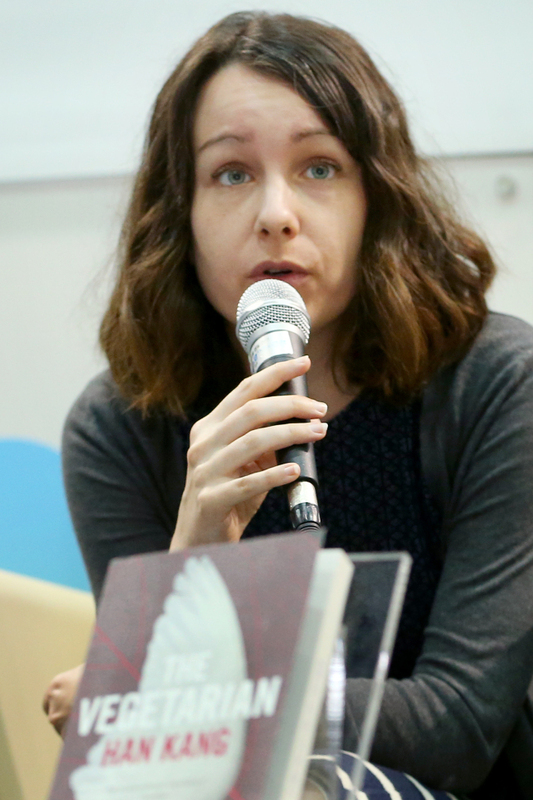 Smith, the joint recipient of this year’s Man Booker International Prize alongside Han for “The Vegetarian,” used Wednesday’s press conference to address the many questions that have been raised about her work. Her evocative translation has been the topic of much debate here since the Booker win last month. There have even been reports comparing excerpts from the original text and translated version line-by-line, with some suggesting that there are instances of mistranslation. Smith responded to those discussions by raising the point that translation is now widely seen as an act of “creatively writing” in another language, employing various degrees of interpretation. “Translators feel a great responsibility to the original text. ... I would only permit myself an infidelity for the sake of a greater fidelity,” she added. On the theories and techniques of translation, Smith said that one is not more correct or legitimate than the other. Aware of the controversy here concerning her qualifications as a translator of Korean literature, Smith, a 28-year-old British national who first learned Korean six years ago, spoke of the “danger of excluding or prioritizing certain translators” based solely on qualifications. “Love of literature, patience and dedication are more important,” she argued. Smith was optimistic about the global expansion of Korean literature, pointing to the “many well-funded, well-staffed institutions working actively to achieve this goal” such as the Literature Translation Institute of Korea. Smith previously translated Ahn Do-hyun’s novel “The Salmon Who Dared to Leap Higher” and Han Kang’s novel “Human Acts,” published this January in the U.K. and set for publication in the U.S. in the near future. She also translated Han’s most recent book, “The Elegy of Whiteness,” which is set for publication in the U.K. next year. Tilted Axis Press, the not-for-profit publishing company devoted to contemporary international literature which Smith founded last year, signed an MOU last June with the LTI Korea to publish Korean literature abroad.